The 2018 Offaly Road Race series came to a conclusion in Birr last Friday evening, and, like the 8 previous races in the series, race 9 certainly didn’t disappoint either, with Mick Fogarty (Ferbane AC), the dominant male in the series, leading the field home. Pop Up Races were delighted to time all 9 events in the Series, and one thing became very evident as the series progressed…Athletics in Offaly is alive and well. The series had 9 races, and participants best 6 scores counted towards their overall league position. The league, compiled by Pop Up Races in conjunction with the Offaly County Board, was based on Age Category positions in each race. There were also team leagues, with the onus on each club in Offaly to provide a certain number of participants at each event to count towards the overall team prizes. The result was extremely positive – 625 Offaly Athletes taking part, along with hundreds more running with clubs outside of Offaly. It was encouraging to see all of the clubs get behind each other, supporting each others races, and it all lead to some top class road racing throughout the Midlands, starting in March and reaching its conclusion in Birr in early August. The series itself was fascinating. So many athletes proving the age old saying that age is only a number. From Conor Butler, the male junior winner, to Jim Langan, knocking out 26min 5k’s in the Over 70’s category, the standard across the board was strong. Our message having seen the success of this series first hand is simple – when clubs and county boards work together, everyone wins. In a market flooded with races, Offaly Athletics did things differently, and gave athletes a reason to run races within the county. €10 for a chip timed race, and usually an impressive spread of food and drink afterwards to match! You can’t ask for more than that. The rivalries, the friendships, the banter created as a result of racing the same people on a regular basis all added to a wonderful experience for athletes and clubs alike. 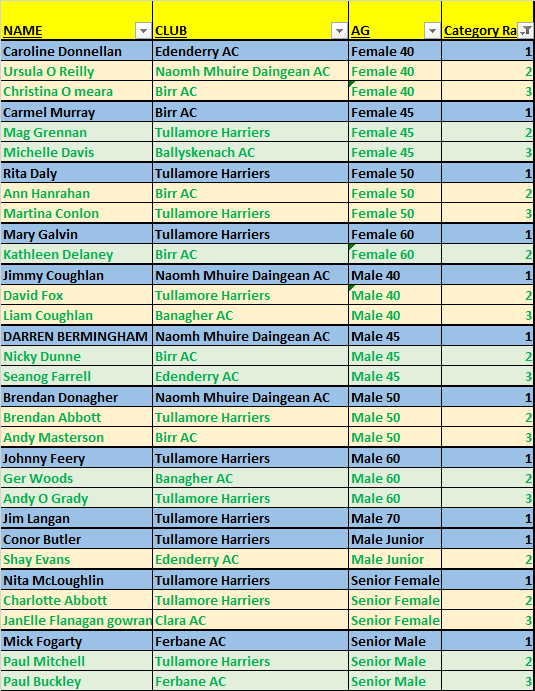 The list of category winners can be found below, while a full table of Offaly Athletes can be found on the following table. Well done to all who participated, well done t o all of the clubs that hosted events, and well done to Darren, Mary, Gerard and all in Offaly Athletics for pulling it together. Athletics in Offaly is alive and well.